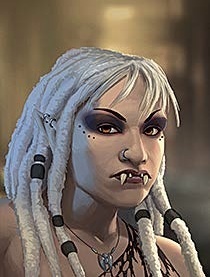 An eco-shaman with long dreads, Samson was largely in charge of the hosptial on Deimos. She was sent to Deimos for her role in some anti-corp actions in the Seattle area after the crash of ’64. She is a fan of 20th century sci-fi books. Recently paroled from Deimos, she decided to settle on Mars. She mostly stays out in the wastes, although she occasionally enters the city, most recently for her friend HCB’s funeral. She operates a sliding scale clinic while traveling the city and the wastes, offering magical and mundane healing, arts she perfected on Deimos. She has also been catching up on her reading. Back on Earth due to the nanopocalypse on Mars, she has settled in Lagos, a familiarly chaotic environment. Set up shop with fellow evacuee Doc Todd.